chances of any one of us winning are hard to think about. Credit: adrigu, used via Flickr Creative Commons licence. What are your chances of winning the lottery? How about of making it big in Hollywood, transmitting a genetic disease to your child or dying of cancer? Some would say it’s 50:50, you either do or you don’t. But they’d be wrong. Many decisions in life, big and small, are based on understanding probability. But how well do you really know how probability works? Taking the time to understand it could change your life. We are all familiar with the idea of probability as the likelihood that any given event is going to happen. In mathematical terms, however, it is defined as the ratio of “favourable” cases, or the scenario whose probability you are measuring to the whole number of possible cases. This sounds complicated, but it’s really not. Say that you have a drawer full of pens and you know that ten of them are blue and three of them are red. You want a red pen – this is your favourable case. What’s the chance of getting a red pen? The probability of you putting your hand in the drawer blind-folded and pick up a red pen is the number of red pens – three – divided by the overall number of pens – the three red pens plus the ten blue pens, which makes thirteen pens. Three divided by thirteen is 0.23, or 23%. So you have a 23% chance of picking up a red pen if you stick your hand in the drawer. A simple calculation of probability is very useful for some events where everybody’s chances are the same, like buying a lottery ticket. For example, the US Lotto sells about 30 million tickets every draw. Therefore, if you only buy one ticket your probability of winning is one over 30 million, which computes at about 0.000003%. That’s much, much less than 50:50. But what does such an extreme number actually mean? Hold on, we’re getting to that. There are many ways to understand numbers that are either very small or very large – and are therefore outside what we usually experience. The easiest way to deal with them is to think in ratios. As we said, 0.000003% is about one in 30 million, which is pretty self-explanatory: for every 30 million who enter the lottery, one will win. 30 million’s still hard to imagine though. So, another good way is to compare very large numbers to something you are familiar with. For example, Yankee stadium at full capacity fits about 50,000 people. 30 million people is 600 full Yankee stadiums all together. That means that out of 600 Yankee stadiums’ worth of people, only one is going to win the lottery. As you can tell, the odds are not good. Things get a bit more complicated when more than one thing is happening at the same time. A famous example used in statistics is the probability of two people on a room having the same birthday. Imagine the scenario: a small house party, about 20 people in the room eating and drinking and chatting to each other. You run into somebody who shares your birthday. That’s crazy! You’re instant best friends. What are the odds?! Let’s find out. To calculate the probability of two events taking place at the same time, you need to multiply the probability of each individual event happening. Calculating the probability in the case of the shared birthday will give you a surprising result – if there are 23 people in the room, there is a 50:50 chance that two of them will share a birthday. It seems crazy, but that’s because there are a lot more than two events happening in this case. What really matters is not so much looking at the chance of sharing your birthday, but rather the chance that any two people were born on the same day. The lesson to learn from this example is that your instincts can easily be wrong when understanding probability – so looking up the actual figures is really important. Most of the big problems that we are faced with are even more complicated than this, probability wise. The big question everybody asks me is what your chances are of being diagnosed with cancer. Just looking at the numbers – how many people there are in the world and how many people are diagnosed with cancer, women do have about a 50:50, or one-in-two, chance of being diagnosed, while men have a one-in-three chance. However, the issue with cancer as well as any other medical probability is that these numbers are very misleading. Cancer is not, in fact, as random as winning the lottery. First of all, your chances of getting cancer depend on your genetic makeup. For example, if you estimate the chance of any woman being diagnosed with breast cancer by assuming every women in the world is the same, you find that any woman has about a 12% chance. However, women who inherit a specific mutation in the BRCA1 gene have about a 60% chance of developing breast cancer. What’s more, women who inherit mutated BRCA1 and BRCA2 genes have up to an 80% chance of being diagnosed with the disease. This means that that 12% is not distributed equally – with some women actually being at much higher risk and other women being at much lower risk of having breast cancer. Secondly, and most importantly when it comes to making decisions, your probability of getting many diseases is directly related to choices you make in how you live your life. This is in fact true for any type of probability. If you think back to the lottery example, you can in fact only win the lottery if you buy a ticket. Similarly, there are certain things you can do that dramatically increase your risk of being diagnosed with cancer or other serious diseases. The classic example is smoking. About 60% of smokers will die of smoking-related diseases, including heart disease, strokes and cancer. These numbers get interesting when looking at the chances of lung cancer. Lung cancer is a very rare disease in people who have never smoked: if you are a man who has never touched a cigarette you have about a 0.2% chance of getting it – that is about 1 in 500. However, if you are currently a heavy smoker you have about a 24% chance of being diagnosed with the disease – that is, about 1 in 5. This means that by smoking heavily you have multiplied your chance of getting lung cancer by 100-fold. 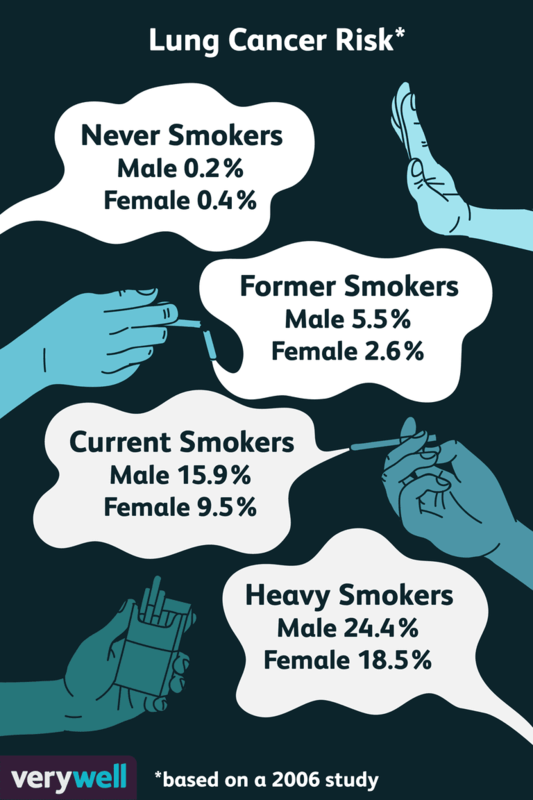 Of course, the bottom line of looking at statistics is “What do I do now?” Let’s look at the example of smoking. If you smoke, there’s a 6-in-10 chance you are going to die because of it. Is the risk worth it? That decision is up to you. Another dramatic example is being overweight. Being clinically obese carries a much increased risk of being diagnosed with a variety of diseases, including cancer. In fact, obesity is the second highest behavioural risk factor for cancer after smoking. Being obese quadruples your chances of developing endometrial cancer if you’re a woman – that’s a 300% increase. It doubles the chance of diagnosis with stomach, oesophagus, liver and kidney cancer, a 100% increase. These odds would be a strong encouragement to make lifestyle changes necessary to lower your risk of getting cancer. However, not all decisions are so potentially clear cut. A classic example is hormonal birth control for women. Being on the birth-control pill increases your chances of being diagnosed with breast cancer by about 30% - which is a relatively small increase compared to the examples above. On the other hand, birth control can actually decrease your chances of being diagnosed with cervical cancer by about 30%. What’s more, hormonal birth control can make a huge difference to your life if you are a woman of reproductive age. In this case, breast cancer risk, ovarian cancer risk and the social and economic benefits of birth control are all factors in a decision that is more complicated than simply tallying up numbers. Understanding statistics is the first step to use science to making informed choices. However, most life decisions are not just a matter of weighing percentages against each other. Understanding what the real odds are is the first step towards weighing them against other factors in your life. Taking risks is a part of life, but being aware of the size of the risk is the only way you will ever be fully in control the decision you are making. *Or at least that's what ScienceSeeker's editor-in-chief Andy Extance and mathematics editor Peter Krautzberger reckon. Andy's happy to explain or to hear from anyone more expert if they think this is wrong.